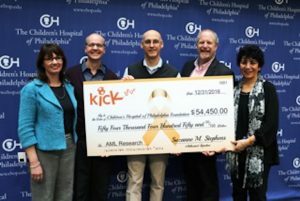 The Kick Leuk Foundation Co-founders Bob and Suzanne Stephens, along with board member Rob Boyce and his wife Nancy, recently presented Dr. Richard Aplenc, oncologist and head of the Acute Myeloid Leukemia (AML) Research Project at the Children’s Hospital of Philadelphia (CHOP), with a check for $54,450. Since its inception in 2013, Kick Leuk Foundation has donated more than $215,000 to CHOP for pediatric leukemia research. “Funding from KLF has allowed us to develop a new approach for finding potential targets on the outside of AML cells,” explained Aplenc. “This approach allows us to discover many more new proteins than could be previously discovered. We have now started analyzing pediatric samples, with a goal of analyzing 100 samples from children with AML. After their 15-year-old daughter was diagnosed with AML in 2010, Suzanne and Bob Stephens of New Hope became aware of how little government funding there is for pediatric cancer research. 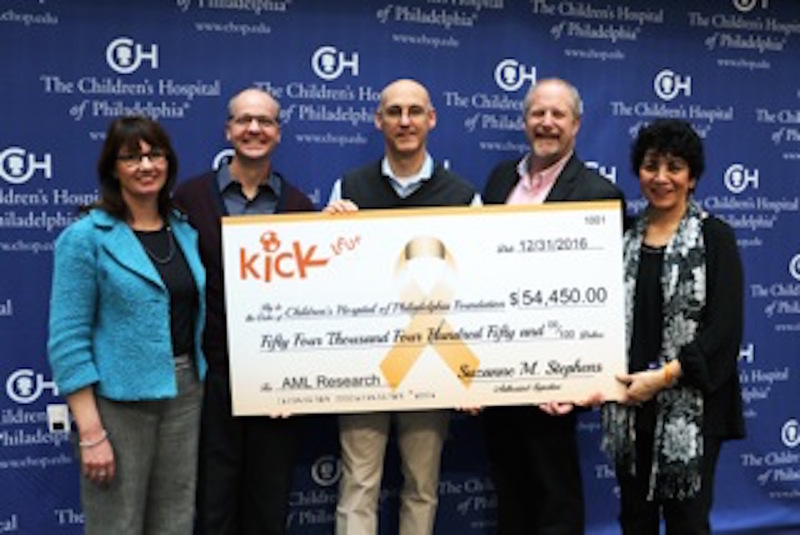 They created The Kick Leuk Foundation, a New Hope, P.A.-based organization, to raise awareness and funds for pediatric leukemia research through private donations and special events. KLF volunteers also coordinate and deliver dinner, donated by area restaurants, to the Ronald McDonald Oncology Family Room at CHOP each month. Additionally, KLF helps to defray the cost for an oncology family’s stay at The Philadelphia Ronald McDonald House. For more information, visit Kick Leuk Foundation online.